Guests aboard the ROATAN AGGRESSOR™ will experience the best diving in the Bay Islands of Honduras which is both easy and exciting. The Bay Islands are world-renowned for their sheer walls, mystical wrecks, massive barrel sponges and captivating macro critters. These waters are also home to larger marine species, such as Whale Sharks, Caribbean Reef Sharks and Bottlenose Dolphin. The region has fantastic critter diving with subjects like Electric Rays, Longsnout Seahorses, ferocious looking Spoon-nose Eels, Rough Box Crabs, Yellow-headed Jawfish, Sailfin Blennies and even Southern Stargazers. Roatan is ideally situated along The Mesoamerican Barrier Reef System (the second longest barrier reef in the world) that extends north of the Yucatan Peninsula and down to the Caribbean coast of Honduras. This extensive reef attracts a wide variety of marine animals and feeds the Bay Islands with healthy and diverse populations of fish and other marine creatures. Roatan used to be the base of operations for more than 5,000 pirates. Now, passionate, “in the know” scuba divers are the new swashbuckling buccaneers seeking marine treasures at sites such as the Aguila Wreck, Mary’s Place and Coco’s Sea Mounts. The Bay Islands of Honduras consist of eight islands and 53 small cays located off the northern coast of Honduras. Roatan is the largest with mountains and hilltops with Utila being very different with low mangrove swamps, hills and fertile soil. Many major airlines fly direct nonstop from the USA to Roatan (RTB) from multiple gateways on Saturday: American Airlines, Delta, and United. There are many direct flights from the US and several connecting flights through the US gateway cities of Miami, Atlanta, Houston and Dallas. The ROATAN AGGRESSOR™ departs from the dock located at Romeo's Restaurant in French Harbor, Roatan. It is located 7 miles from the Roatán International Airport (RTB) in Coxen Hole. Guests arriving into the Roatán International Airport on Saturday will first clear customs then proceed outside. There are several options depending on what time you arrive. You may take a taxi to Romeo's Restaurant and store your bags on the ROATAN AGGRESSOR™ and have lunch until boarding at 3:30 pm or, from the airport you may take a taxi to the host hotel, Clarion Suites at Pineapple Villas in French Harbor and have lunch and enjoy their facilities. 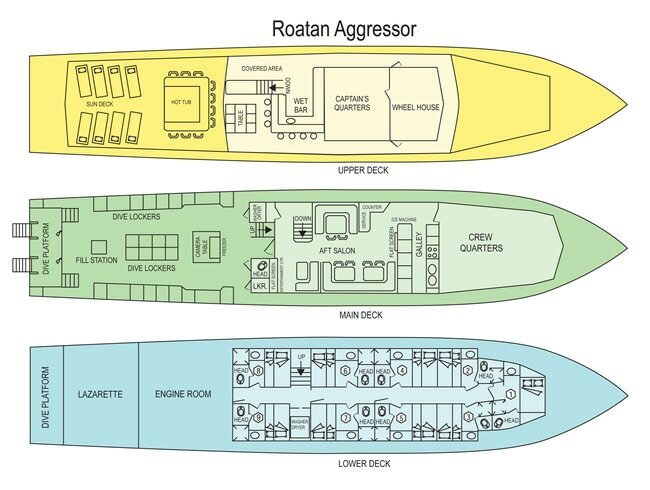 There is one complimentary transfer at 3:30 pm from the Clarion Suites to the ROATAN AGGRESSOR™ on Saturday. Guests may board the yacht anytime between 3:30 pm - 6:00 pm. Everyone must be onboard by 6 pm. After a full week of diving, the ROATAN AGGRESSOR™ returns back to the dock located at Romeo's Restaurant Friday afternoon after lunch (2 dives offered Friday). A sunset cocktail party will be hosted on the sundeck with dinner ashore. This is the only meal not included in the charter. Guests may dine at Romeo's Restaurant or at one of several local restaurants close by. Check-out is Saturday morning at 8 am. The crew will assist organizing transportation back to the Roatán International Airport or the host hotel if you are extending your stay. Late Saturday Departure: For guests departing Saturday afternoon a day package option can be purchased onboard the Roatan Aggressor that will include transportation from the yacht to the Clarion Resort (host hotel) where guests can enjoy the beautiful facilities. The cost is $45 plus tax and includes transportation from the yacht to the Clarion, lunch, use of the facilities and transportation to the airport. A port/park fee of $95 USD will be collected at the end of the week. A 15% VAT tax will be charged for onboard purchases and courses. The VAT will not be charged on Nitrox or rental equipment. Not included in your charter price. All Roatan Aggressor photos © Copyright Aggressor Fleet & WayneWorks Marine LLC.